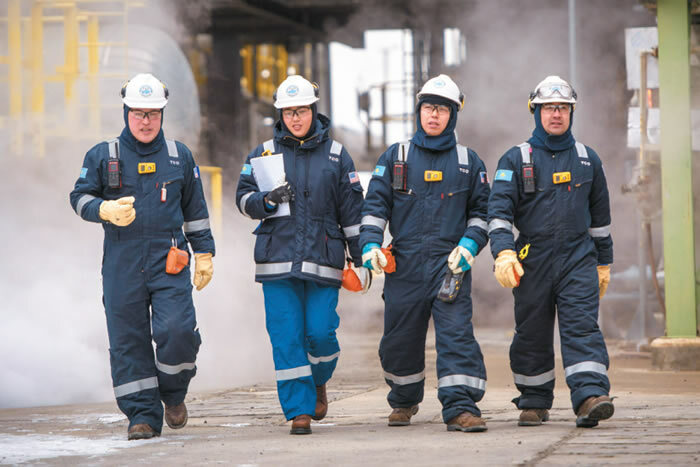 Over the past 26 years, Tengizchevroil (TCO) has risen to become a leader in Kazakhstan’s oil and gas industry. TCO produces oil, gas and associated products that fuel the modern economy and our history is interlinked with the rise of an independent Kazakhstan. 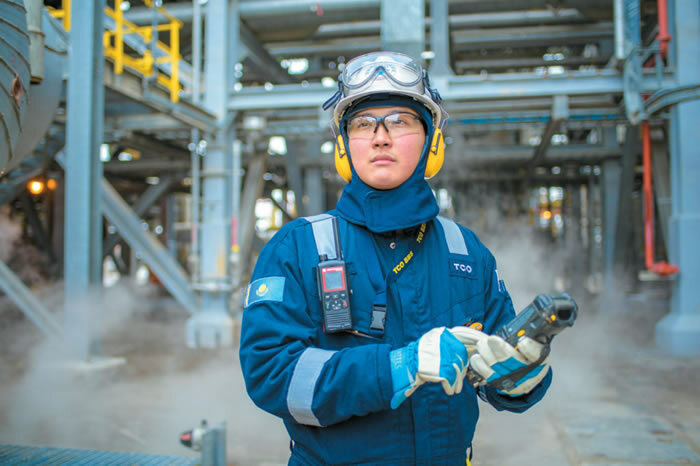 At TCO, we strive to contribute to Kazakhstan’s economic progress and future, and to build a new legacy for generations to come through safe and reliable operations at our facilities in Western Kazakhstan. Last year, TCO achieved several significant milestones in our ongoing journey to create value for the Republic of Kazakhstan, our four shareholders and the communities where we live in operate. Tengiz, the center of TCO’s activities in Atyrau Oblast, is one of the most prolific oil and gas producing fields in the world today. 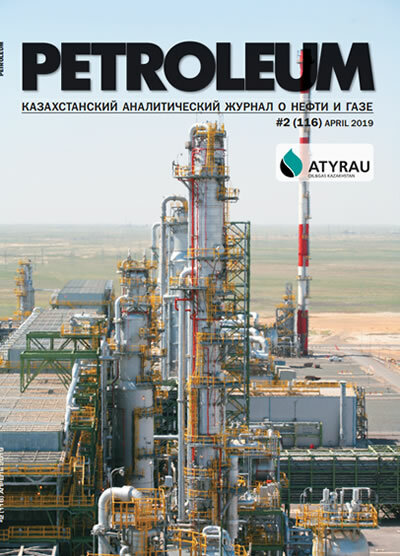 In 2018, production from Tengiz accounted for approximately 31 percent, or 28.6 million tons (228.2 million barrels), of Kazakhstan’s overall production of 90.36 million tons of crude oil. This level of production exceeded planned production figures for the year by 3.3 percent despite a turnaround at the complex process lines facilities at KTL-2 (one of five such facilities in Tengiz) in September. Maintenance during the KTL-2 turnaround, which was completed ahead of schedule thanks to the outstanding efforts of more than 8,200 people, involved work on over 250 columns, vessels, reactors and heat exchangers, as well as more than 1,000 valves. During the overhaul at KTL-2, the remaining four process lines at KTL, as well as the Second Generation Plant and Sour Gas Injection facilities (SGP/SGI), provided for continued stable production at Tengiz. In addition to producing oil, which was fully exported through the Tengiz-Novorossiysk pipeline of the Caspian Pipeline Consortium, in 2018 TCO sold more than 1.3 million tons of liquid gas, 9.2 billion cubic meters of dry gas and 2.5 million tons of sulfur. We also continued to advance the Future Growth and Wellhead Pressure Management Projects (FGP-WPMP). Both projects, after their completion, will increase oil production in Tengiz by 12 million tons, to 39 million tons per year. WPMP will ensure full load of refining capacities of all the plants operating in Tengiz by reducing wellhead pressure of the blowing wells and by increasing pressure at the inlet of six existing integrated process lines. The launching of the Cargo Transportation Route (CaTRo) last year enabled the start of unloading, storage and delivery of FGP modules to the work site in Tengiz and the assembly of the main equipment for FGP-WPMP. Modules are made in Kazakhstan, South Korea and Italy. After pre-assembly of the equipment in modules, they are sent by chartered heavy-load vessels to Tengiz for final assembly and installation. Unloading is carried out at a specially-built terminal at the Prorva port in the Caspian Sea. In autumn 2018, the first module of Frame 9 gas turbine generators (GTG), manufactured in Avenza, Italy, was delivered to the construction site of the future Third Generation Plant (3GP) of FGP-WPMP. The delivery to Kazakhstan was carried out from the Italian port of Marina di Carrara through the Bulgarian port city of Burgas, and then along the Southern route of the Russian inland waterways to CaTRo. GTG components continue to arrive at Tengiz this year. In addition, twelve assembly modular blocks made in South Korea were sent through the transshipment base at Hamina port (Finland) and further along the Northern route of the Russian inland waterways last year. In mid-September in Tengiz, the contracting company Sarens, responsible for lifting heavy cargo with the help of self-mobile conveyors at 3GP, installed the first pre-assembled rack manufactured at the ERSAI production site in Mangistau Oblast on permanent foundations. Several modules from ERSAI are waiting their turn at Tengiz for assembly and installation. In total, 28 pre-assembled modular racks for the project were delivered from ERSAI to the 3GP and Third Generation Injection (3GI) sites at Tengiz. A Tengiz-based common services group provided all important services in the work plan for infrastructure, capital facilities and a joint production management center. At the end of December, the control and power supply systems group installed the main substation of 3GP on the foundation. The assembly system group made significant progress on field facilities and pipelines. Concrete works and laying of underground pipeline are continuing at 3GP. In November, the first gas turbine generator was reassembled. General construction and underground works continue. At TCO, we conduct our business responsibly, we deliver results the right way and we differentiate our performance through our people. We believe that sustainable local companies are beneficial to the economy, and we support businesses to help them enhance their capabilities and to prosper. As part of our commitment to investing in local businesses, we have prioritized investment in Kazakhstani content in FGP-WPMP. More than 45,000 Kazakhstanis work on the project within the country, which is 91 percent of the total number of project personnel in Kazakhstan. TCO has engaged Kazakhstani organizations to participate in engineering design, procurement and manufacture of modules for FGP-WPMP. Currently, more than 2,100 companies participated in the preliminary selection phase, where more than 400 companies received contracts. Representatives of FGP-WPMP visited the facilities of more than 160 Kazakhstani companies to assess their production capabilities. TCO carries out its production activities in strict compliance with environmental requirements. Between 2000 and 2018, we invested $3.1 billion on projects to reduce impact of operations to the environment. Currently, TCO’s gas utilization rate at Tengiz is 98 percent. The company has made significant investments in improving the reliability of equipment at all plants. From 2000 to 2018, the volume of unscheduled flaring decreased by 98 percent. Since 2000, total air emissions per ton of produced oil have decreased by 72 percent, while TCO has increased its annual oil production by 2.7 times as a result of investments in new capital projects and equipment reliability. TCO has made a significant impact on the Kazakhstani economy. From 1993 until 2018, TCO’s direct financial payments to Kazakhstan amounted to more than $135 billion, including salaries of Kazakhstani employees, purchases of goods and services from domestic producers and suppliers, payments to state enterprises, payment of dividends to the Kazakhstani partner, and taxes and royalties transferred to the state budget. In 2018, direct payments to Kazakhstan exceeded $10.1 billion and TCO purchased goods and services from Kazakhstani suppliers in the amount of more than $3.5 billion, including more than $ 2.3 billion for FGP-WPMP. In total, since 1993 TCO has purchased goods and services from Kazakhstani suppliers in the amount of more than $28 billion. 2018 was a milestone year for TCO and we are making significant progress on building the future through of Tengiz. FGP-WPMP is a landmark project for the Republic of Kazakhstan that will deliver the promise of a world-class petroleum resources for future generations.